Known as High Falls, this is where Rochester began. 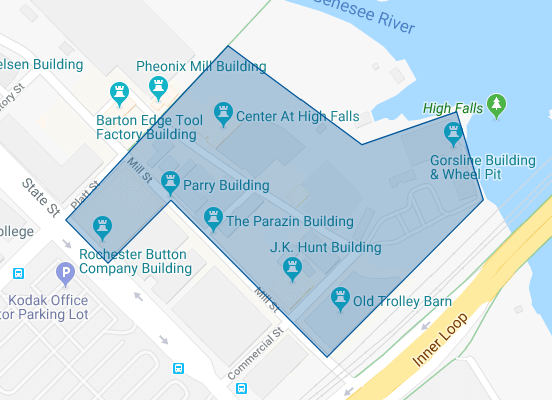 Raceways dug in the early 19th century fed water from the Genesee River into buildings to power flour and lumber mills. Several of these buildings remain, along with the city’s waterworks and remnants of an 1816 mill. View the river side of the district and the waterfalls by crossing the 800 foot long Pont de Rennes pedestrian bridge. 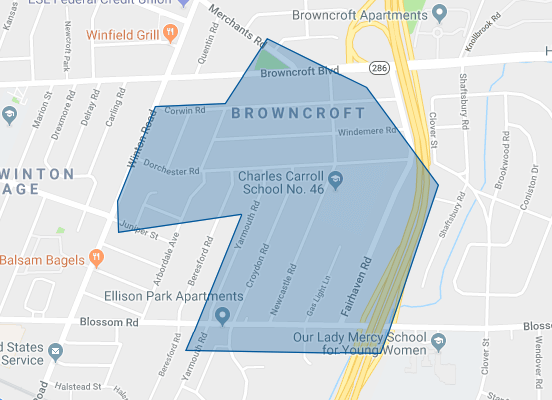 Architectural Digest or Better Homes and Gardens could find ample photo opportunities in the Browncroft neighborhood. Over 400 homes are listed on the National Register of Historic Places. Large houses fronted by sprawling lawns and big trees (blue spruces, red maples, magnolias and beeches, to name just a few) can be found in this historic district. This glorious confluence of residences and landscape design is the long-lasting gift of Charles J. Brown, president of Brown Brothers Nursery Company, and later real estate developer of the area. 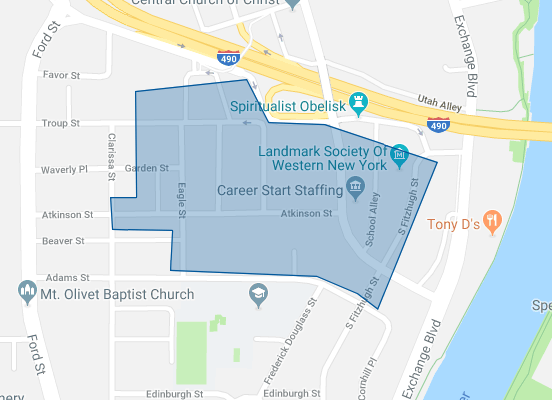 This district includes buildings in a variety of architectural styles including Queen Anne, Colonial Revival, Gothic Revival, and Tudor Revival, Mission Revival, and Bungalow / American Craftsman. The dwellings reflect designs directed toward a middle-class and working class clientele in a newly developing area of Rochester’s 19th Ward. Located in the district is the former St. Augustine Roman Catholic Church complex. Cited as one of the greatest catalogues of 19th and early 20th century urban residential architecture in New York State, the mile and a half long district is lined with an extraordinarily consistent array of elegant buildings. Regarded by many as the city’s most beautiful street, East Avenue still retains much of its original character as the “grand boulevard” of Rochester. The side streets surrounding the avenue reflect the grandeur of the area on a smaller scale, but with equally impressive detail. 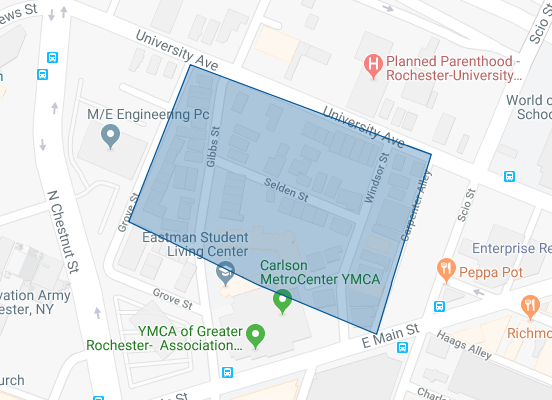 A downtown neighborhood around the Eastman School dormitory. Significant both architecturally and historically, this compact district contains a variety of small-scale residential buildings. The neighborhood is the last remaining 19th century residential area within the central business district. It is historically important as the remains of the semi-private compound built in the 1800’s by two prominent families, the Wards and the Seldens. 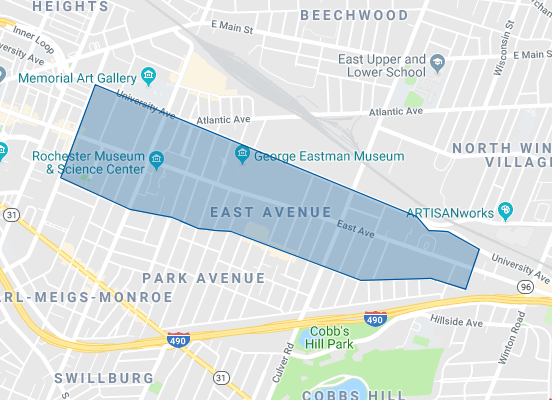 This district includes buildings in a variety of architectural styles including Colonial Revival, Arts and Crafts, American Foursquare, and Tudor Revival. The dwellings reflect designs directed toward a middle-class clientele in a newly developing area of Rochester’s Nineteenth Ward. 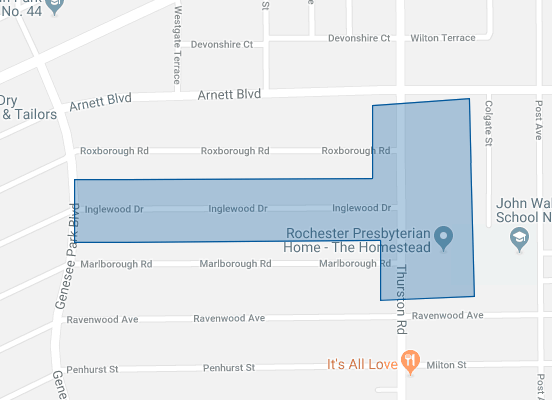 Located in the district is the former Emmanuel Lutheran Church (now the Ebenezer Baptist Church) and the Rochester Presbyterian Home. Located in South Wedge, the houses were constructed between 1872 and 1913 in a variety of vernacular interpretations of popular architectural styles including Gothic Revival, Italianate, Queen Anne, and Colonial Revival styles. The houses are 2 1/2-stories, are of frame or brick construction, and were designed by local architects employed by the developer Ellwanger & Barry. Among the more prominent are Andrew Jackson Warner and Claude Bragdon. 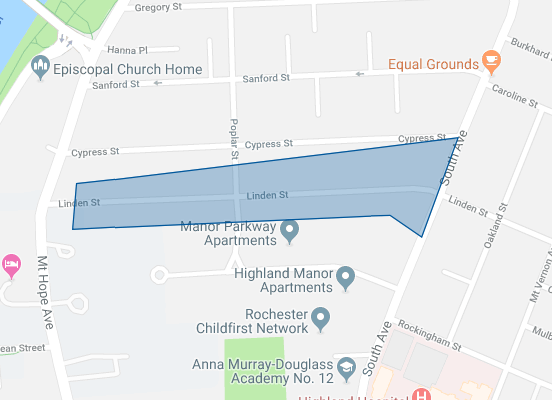 West Main St – Also just outside downtown, this neighborhood would still be recognized by its namesake (Susan B. Anthony), who lived at 17 Madison Street from 1866 until hear death in 1906. 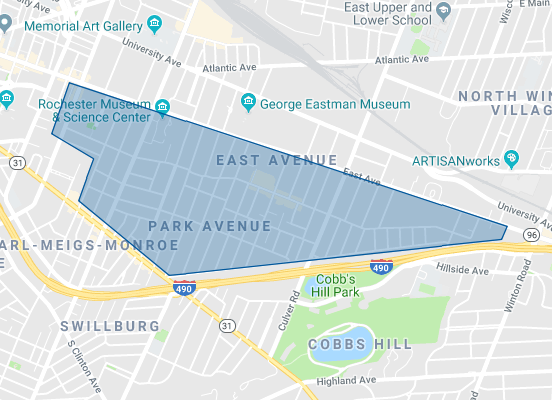 An outstanding example of a 19th century middle class neighborhood, the district is a compact area of four streets that surround a park square. The buildings represent a variety of architectural styles, including Greek Revival, Italianate, Second Empire and Queen Anne. Alongside the residential neighborhood are industrial buildings of the early 20th century, including the factories of the Cunningham Carriage Works, a maker of automobiles and aircraft. 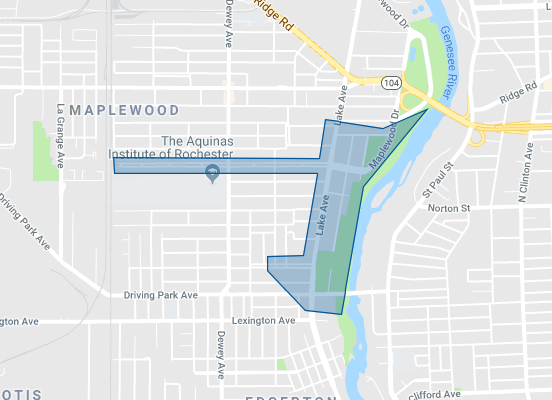 The Maplewood neighborhood may have stayed only a park had the city agreed with landscape architect Frederick Law Olmstead’s original plan – a linear park along the Genesee River gorge that joined Seneca Park with Maplewood Park. Instead, between 1870 and the 1930s, grand estates on large lots and architecturally distinctive homes were built on its shady tree-lined streets. Today residents enjoy the best of urban living: beautiful older homes that increase in value (many are listed in the National Register of Historic Places) and a lively diverse population working together to preserve its history and protect its future. 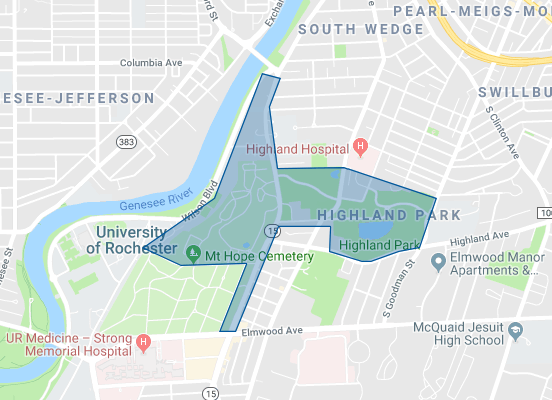 Exhibiting the horticultural heritage of Rochester, this district south of downtown includes the Frederick Law Olmsted designed Highland Park, and the nation’s first municipally owned Victorian cemetery. Once the exclusive domain of the Ellwanger & Barry horticultural business throughout the mid to late 19th century, the district retains its elegant and spacious parkland character. The district is punctuated with notable architect-designed buildings combined with a more tightly-knit early 20th century subdivision along the district’s fringes. Pick a street, any street off Park Avenue, and a bevy of historic homes in a pleasing variety of architectural styles are found, several designed by famed architect Claude Bragdon. Tudor mansions are companions to Prince Anne cottages; older brick apartment buildings abut single-family homes. Landscaped lawns, full shade trees, garden sculptures and pocket parks are all part of this prestigious preservation district. 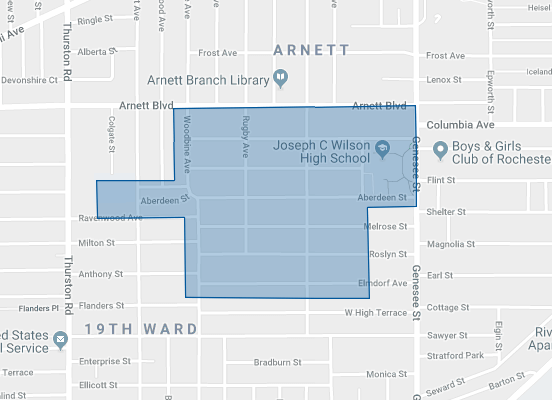 Part of the 19th Ward, residents here pride themselves on the rich diversity of their neighborhood and are passionate about their community. 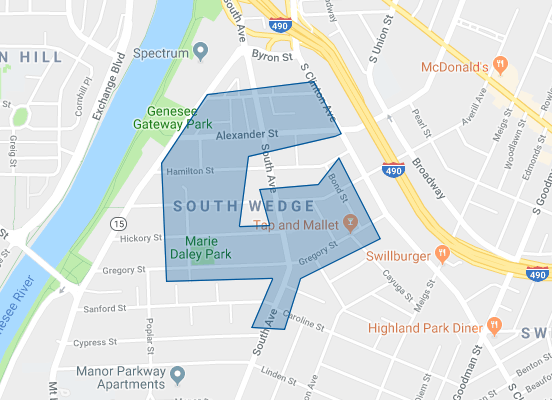 Community activism and diversity have infused the character of the South Wedge neighborhood from its very inception in 1824, and this spirit continues in one of Rochester’s most diverse and vibrant neighborhoods. Housing in the Wedge contains some of the oldest buildings in the city from 19th century “painted ladies”, houses painted three or more colors, in the Linden-South Historic District, to a four-story, 33-apartment brownstone, South and Hickory Place, completed in 2010, there are options for all. 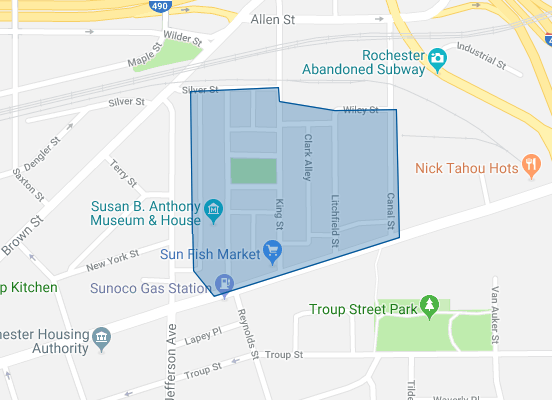 The “stuffed shirt” neighborhood just outside downtown where merchants in the early days of the Erie Canal built their homes. 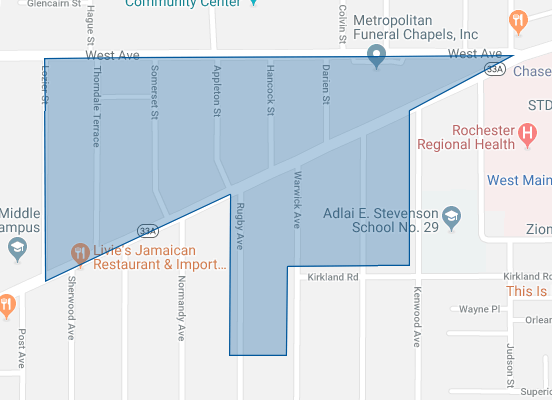 The oldest residential area in the city, the Third Ward was for over half a century Rochester’s choice residential district. Millers, merchants, craftsmen and professionals built homes soon after the Erie Canal was completed nearby.